Williams plays a backhand during the tournament in June. "I feel like a warrior in it, a warrior princess ... from Wakanda, maybe," she told reporters in May, referring to the movie Black Panther. "I've always wanted to be a superhero, and it's kind of my way of being a superhero." Williams won the 2017 Australian Open when she was nearly two months pregnant, and she gave birth to a daughter last year. But the birth was followed by a six-day medical crisis in which Williams suffered blood clots in her lungs, and she says she nearly died. So like any good superhero costume, Williams' black Nike catsuit was functional. "I've had a lot of problems with my blood clots, God I don't know how many I've had in the past 12 months," she said at the May news conference. "I've been wearing pants in general a lot when I play so I can keep the blood circulation going." 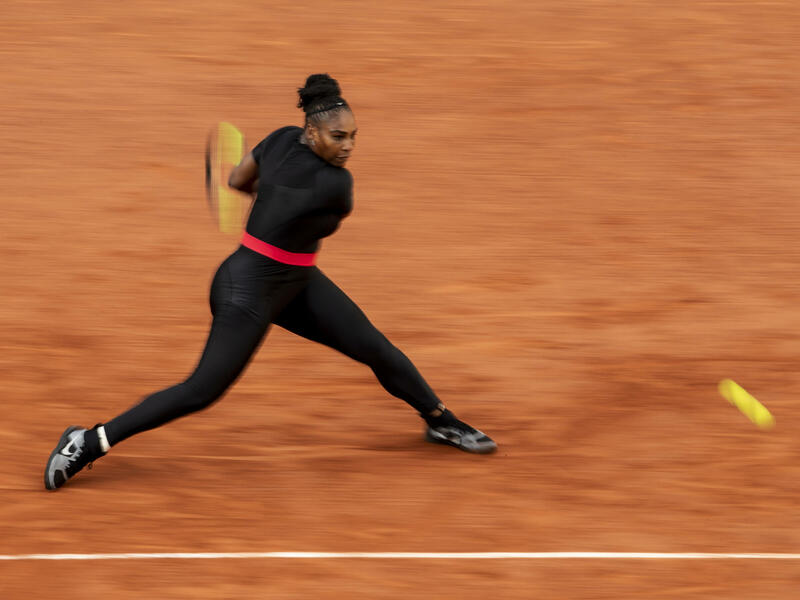 But in an interview with Tennis magazine, French Tennis Federation President Bernard Giudicelli reportedly said the tournament would be introducing a dress code. "I think that sometimes we've gone too far," Giudicelli said, according to The Associated Press. He specifically mentioned Williams' outfit and declared: "It will no longer be accepted. One must respect the game and the place." He said the French Open's dress code would not be so strict as the one at Wimbledon, which requires players to dress almost entirely in white. "White does not include off white or cream," the English tournament clarifies, in case you had doubts. Williams, who Forbes says is the top-earning female athlete in the world, has won the French Open three times.